UDM Downloads > Convert Contacts from CSV to PST! Many users make use of CSV files for transferring tabular data between two different applications, like between a spreadsheet program and a database program. However, due to some reason if you need to convert your Comma Separated Value (CSV) to Outlook PST, then SysTools Excel to Outlook software can help you. This question must be confusing you that - Which is the right option to convert contacts from CSV to PST? 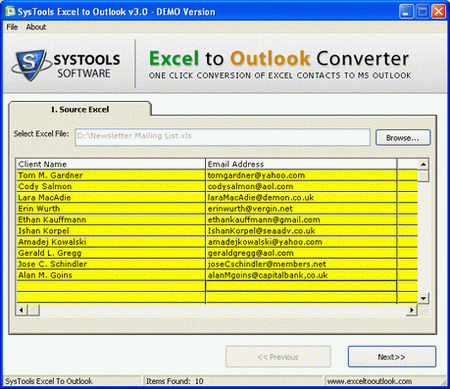 Just purchase SysTools Excel to Outlook conversion software. It can perhaps be the right solution for you. It will definitely help you to convert your CSV file to Outlook PST file. It is not necessary that you directly purchase our software as SysTools provides the users a facility to first check the software before purchasing. Download the Demo version of the software. This facility will be really advantageous to you as you would become more familiar with the software after checking the Demo Version. Our Demo Version is a functional version just like the Full Licensed Version but it will only allow limited conversion. You can convert only first 5 items form Excel to Outlook with the help of the Demo Version. If you are satisfied after checking our Demo Version and you wish to save all your CSV file contacts to Outlook PST then without any delay purchase Full Licensed version of SysTools Excel to Outlook software at a very reasonable price of JUST $49 for the Personal License. This Excel to outlook conversion tool will successfully transfer your Excel contacts as well as .csv file contacts to Outlook. You will not face any problem while converting CSV to Outlook contacts using our software.